Next week the dmexco is finally going to open its gates. In the past weeks, we have already presented you our highlights at the annual meeting of the digital industry. Of course, these fair novelties show only a small part of our daily development work at AGNITAS, because much of what our team does is not visible at all in the software of the E-Marketing Manager. In addition, there are customer-specific projects that have to meet the special requirements of a certain company. Therefore, we are all the more pleased to be able to present many features that are actually visible to everyone. Our particular focus lies on extending our EMM with additional channels to the Digital Push Marketing Suite. Of course, we offer a great e-mail marketing tool, but especially the mobile user habits make it necessary to be able to reach the customer in a different way. WhatsApp fulfils the ideal requirements to reach the customer in his everyday life. Of course, there are also enhancements to classic e-mail marketing such as customer insights at the recipient, which enable you to get to know your customers even better. With sub-client capability, on the other hand, you can easily manage access rights, e.g. to the various mailing lists. You can find out more about the individual trade fair highlights below. No matter which trade fair highlight you are interested in, we are looking forward to seeing you at our stand at dmexco (Hall 8, Stand A050). We would be pleased to present our trade fair highlights to you personally. These days WhatsApp is the most widely used messenger service in the world and has overtaken FacebookMessenger itself for some time. 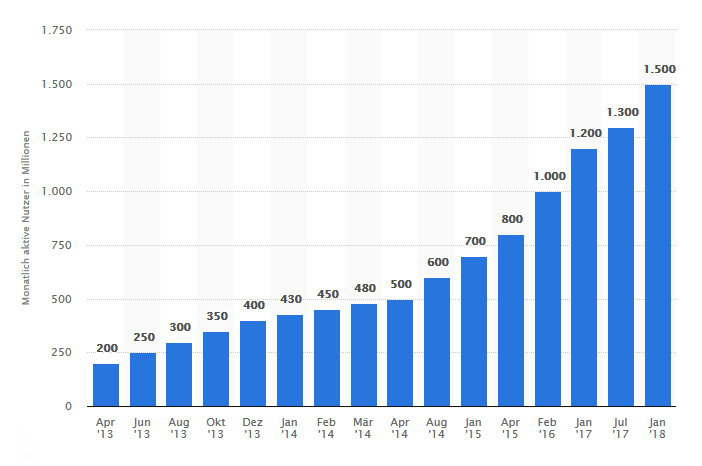 According to a Statista study, the number of active users at the beginning of the year was already 1.5 billion people worldwide. Looking at these statistics, it can be assumed that the user base will continue to grow. WhatsApp is mainly used in the private environment, be it to meet friends or just to ask how you are doing. But WhatsApp also plays an important role in the international B2B communication in order to save expensive connection costs. It’s a fact: The smartphone is always with us and thus WhatsApp is permanently present in the recipient’s most personal environment. But have you ever thought about using WhatsApp to communicate with your customers? So what makes this new touchpoint so exciting? We’ll tell you. What can I use WhatsApp for? In customer communication, automated service messages via WhatsApp can be used as a good complement to classic e-mail. For example, it could be used for shipping information, confirmation of receipt of payment or a short message that the vehicle is ready for collection. In this case, the dispatch is triggered by so-called triggers. Numerous media are already using WhatsApp to spread the latest headlines of the day in a current news ticker. Unlike a newsletter, WhatsApp does not have a design template. The information should therefore be kept short. This makes WhatsApp particularly suitable for short-term and limited offers that have a high exclusivity factor, e.g. two cocktails for the price of one today from 6pm to 8pm or a sample testing for all orders until 12pm tomorrow. Unlike other communication channels, with WhatsApp, there is hardly a message that remains unopened. That’s why you can quickly achieve opening rates of over 90 percent. Unfortunately, with other media, you can only dream about it. As mentioned earlier, WhatsApp is the messenger service with the highest range worldwide. But even if you only look at Germany, 65 percent of the population already use WhatsApp. WhatsApp can send much more than a few text messages with maybe one or two emojis in it. You can share links to your website and the location of the nearest shop, send the latest product video or what would you think about a voice message from an influencer? Thus, there is always a suitable message type for the respective occasion (coming soon). The spam folder we all love and hate at the same time does not exist here. Your message is guaranteed to reach the recipient and will not be intercepted or blocked. So far, WhatsApp itself does not charge a fee for its messenger and messaging. WhatsApp messages are delivered in real time and can therefore also be used for real-time campaigns. Even if there is always speculation, WhatsApp does not officially support the advertising use. Therefore, you should use WhatsApp in the correct dosage to avoid the risk of being blocked by WhatsApp. However, you should do this anyway with regard to your recipients, since sending too often can quickly be considered annoying. After all, you are in his most personal environment. In addition, registration for WhatsApp is somewhat tedious. The recipient must first save the number in the contacts and then give his or her consent to receiving messages by sending a “start” message. WhatsApp is now firmly integrated into our E-Marketing Manager (EMM). Here you will find the corresponding menu, via which you can use the function. If the feature is unlocked (Premium Feature), you can directly create the WhatsApp messages to your customers here. The messages can contain text, images, attachments, emojis and links. 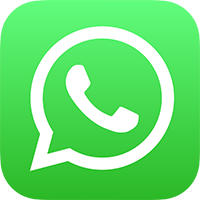 You will receive the mobile phone number for your WhatsApp account directly from us. Our WhatsApp integration is currently still a fully functional beta version. This means that in the future there will be many more functions which are already being developed. In the upcoming months, it will also be possible to send personalized WhatsApp messages. In addition to that, we are currently working on a matching between the WhatsApp contacts and the existing e-mail addresses as well as on a target group selection. Integration into the Campaign Manager is also planned. As you can see, you still have a lot to look forward to. You can also find more information on our website. You work for a larger company with independent business units or branches? Then you probably know the problem: Not every employee of the department, outsider or even customer should have the same access and editing rights to use a system (in our case the E-Marketing Manager). Especially when it comes to personal data. Here, the legal situation was even exacerbated by the GDPR, which only recently came into force. Of course, it is good if the colleague can make a change, substitute for a holiday or take over the contents of campaigns. But giving up all rights is a fire hazard simply because of the high data protection regulations. It is therefore all the more important to assign certain roles and usage rights to individual users of the system. For example, an employee who creates a direct mailing can have all rights. The colleague who is only allowed to proofread can then only change the text, but not the mailing list. The employee from head office creates campaign templates for Christmas. They have full access rights in EMM and can also view the implementation and overall campaign success. However, store managers can only see, write to and evaluate the recipients on their own mailing lists. For whom is subclient capability important? Subclient capability is particularly important for companies in which the data is managed in one client, but the different departments are strongly separated from each other, because they act like internal service providers, for example, or perhaps even compete with each other. The situation is similar with store systems. To avoid errors, to protect the confidentiality of data and to comply with the principle of data economy, it is recommended to restrict the access rights to the recipient/mailing lists. Another case are agencies that manage email marketing for several clients. Here we offer “real” multi-client capability, in which the data of the individual customers is managed in their own clients. In addition to the recipient data, it must also be ensured that no trade secrets are disclosed to the outside world. This means that customers must be managed in completely separate clients. But even here the roles and rights can be assigned flexibly, so that e.g. the customer can see everything, but cannot change anything himself. What does subclient capability add to the EMM? 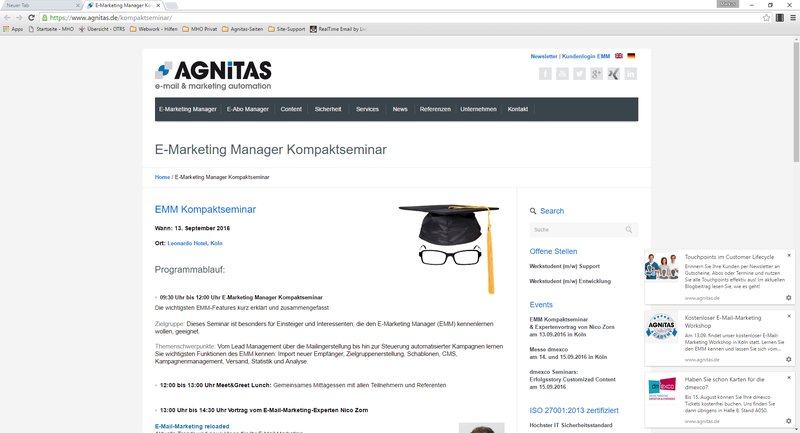 The E-Marketing Manager has long included a rights and role system. However, since no two companies are alike, we ensure that the EMM reflects the broadest possible range of different work structures by means of appropriate extensions. For example, there has been a restriction on the use of mailing lists in newsletters for certain EMM users for some time. This restricted use has now been extended to other areas. This extension is most clearly visible at the receiver. For example, only those mailing lists are displayed in the search result for which the respective user has the appropriate authorization. Furthermore, to avoid duplicates on the different mailing lists, there is now a warning in the EMM if a contact already exists on another mailing list and is to be added again. Similarly, only the status of the recipient (active, logged off, bounced) is visible to the user on the respective released mailing list. This visibility also applies to the Campaign Manager. Here the user can only select the mailing lists for which he has authorization. This restriction also applies to the export, where only the corresponding recipient profiles can be exported from released mailing lists. As already described, when creating new newsletters only the use of the mailing lists released for the respective user is possible. However, the user can view newsletters that are or have been sent on the basis of other mailing lists. He can also use these as a template. However, he is denied access to the recipients addressed in the newsletter. Thus the necessary data protection is also fulfilled and your newsletters are GDPR-compliant in this respect. Web push messages offer an additional channel to reach your customers and prospects with short messages. Small overlay windows show the messages as you browse the web. It does not matter whether the recipient is currently on your website or not. As soon as the browser is opened, the message is shown. The recipient only has to register once for the web push news in order to receive it regularly in the future. No other applications are required to send web push messages, as they are sent directly from the E-Marketing Manager (EMM) to the browser. What are the general advantages of web push? The main advantage is that web push messages offer another channel that is hardly ever used and not very expensive. This gives you a competitive advantage over your competitors and you benefit from the increased attention. In addition, this new touchpoint provides additional incentives to buy. Another advantage is that there are no adblockers for web push and the recipient is guaranteed to receive the message. The end device does not matter either, the message can be played on a desktop PC as well as on mobile devices. An equally important argument for this channel is that the development and operation of a complex app is not necessary. Especially since many apps are no longer used by users after a short time. Which USPs can we offer you? Our competitors obtain the permission on a subdomain. This means that you are permanently bound to this provider for shipping. Differently with us: The permission is raised directly over your URL and you can use these independently of the service partner. If your recipient registers for web push at the same time as subscribing to the newsletter, we can match both permissions. This enables you to form target groups and play personalized content. AGNITAS is not only a web push provider. We offer a professional digital push marketing suite for e-mail, web push, WhatsApp, SMS and fax. Which browsers support Web Push? With web push, you can reach almost all common browsers. Currently, Chrome, Chromium, Firefox, Safari (on MacOS), Samsung Internet and in the future also Edge, support this functionality. This already allows a market coverage of almost 90 percent. What does Web Push actually look like? With web push, the key to success is brevity. Web push messages are short messages that are placed as an overlay over the website. They consist primarily of a headline and a short text. The effect is further enhanced by the integration of an image. Via a link, the interested party gets directly to the desired offer. What do I need to know about Web Push? As with other channels, it is important to find the right frequency of messages played. For one target group it may not be more than 1-2 messages a week, while for another target group you can send this number a day without them feeling pampered. Ultimately, as with all channels, the better you know your target group, the more successful you will be. For example, a personalized address is also possible if the web push message is linked to a newsletter. Further information on web push can also be found here. Make an appointment now! We would be pleased to present our trade fair highlights to you personally. The customer insights at the recipient enable you to get to know your customers and prospects even better. For example, you receive information about the reaction behaviour, i.e. on which days and at what time the e-mails are preferably opened. You will also receive information about the end devices used, such as the preferred use of mobile phones or tablets. What is particularly interesting for shop operators are the newsletters with which the recipient has generated a particularly high turnover. Where can I find these insights about the recipient? To access the Customer Insights, select the profile of the recipient you want to learn more about in the EMM. There you will see the Insights submenu and thus also the overview of the recipient’s user behaviour. What are the advantages of customer insights at the recipient? In our everyday life, we are exposed to a constant flood of stimuli. To be perceived by the desired recipient in this situation, it usually takes more than a nice picture and a good saying. Principally, the better a newsletter or other advertising medium is tailored to the recipient and whose personal preferences are taken into account, the more successful it is. Knowledge of preferred opening hours, for example, makes it possible to adjust the shipping time. This is also possible fully automatically via the Send-Time-Optimizer. If it is known which devices are used, this provides information about the channels on which the mailings must be particularly optimized. Of course, most e-mail templates are now mobile-optimized, but that’s sometimes better and sometimes worse. If you know, for example, that the majority of customers or individual customers who are particularly important, call up newsletters on the move, one or two improvements may be a wise decision. The Customer Insights give an impression of how relevant the newsletters are for the individual customer. This displays the response rate of the past 90 days or the click rate. With the Customer Insights, it is even possible, to find out which sales were generated by the individual customer as a result of mailing campaigns. There is no better feedback for a mailing campaign. From this, conclusions can also be drawn as to what products are especially interesting for the respective recipient. In addition, the average shopping basket value is also displayed. Further optimization potential can also be determined with retargeting values. 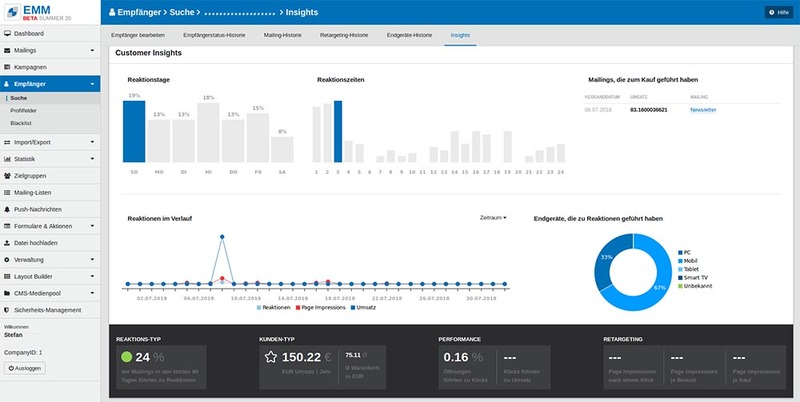 The Customer Insights offer a good opportunity to get to know your e-mail recipients even better and to optimize your mailings according to your preferences. This not only improves click and opening rates, but in the best case even increases sales. The next dmexco highlight is coming next week.